A meal plan should take into account your likes, dislikes and lifestyle. It should be a guide that will help you meet your personal weight and blood glucose goals. What is an Eating Pattern? The Mediterranean style eating pattern focuses on mostly plant-based foods like vegetables, fruit, whole grains, cereals, nuts, seeds, and beans, seasonally fresh, and locally grown foods. Olive oil is the main source of fat. This eating pattern also includes a small amount of dairy products, such as cheese and yogurt, fish, and poultry. Red meat is limited. Wine can be consumed in small amounts (1-2 glasses of wine per day) with meals. The Mediterranean style eating pattern has been shown to protect against heart disease, stroke, and some cancers. Research shows it may also help you improve blood sugar and lose weight. Vegan: This eating pattern includes many plant-based foods such as vegetables, fruits, whole grains, nuts, seeds and beans. People following a vegan eating pattern avoid all meat, poultry, fish and seafood, eggs, and dairy products. Lacto-vegetarian: This eating pattern includes vegetables, fruits, whole grains, nuts, seeds and beans, milk, cheese and yogurt. People following lacto-vegetarian eating pattern avoid all meat, poultry, eggs, fish and seafood. However, dairy products are included. Lacto-ovo vegetarian: This eating pattern includes vegetables, fruits, whole grains, nuts, seeds and beans, milk, cheese, yogurt, and eggs. People following a lacto-ovo vegetarian eating pattern avoid all meat, poultry, fish and seafood, but include dairy products and eggs. Research in the general population has linked vegetarian eating patterns to a lower risk of obesity, heart disease, cancer, and diabetes. Looking for a quick place to start? The Diabetes Plate Method is another option that uses many of the ideas from the eating patterns described above and can be a great place to start for many people with diabetes. This method uses a 9 inch plate. The first step for many people is to use a smaller plate than they have been eating from. Once you have a smaller plate, the idea is to fill half your plate with non-starchy vegetables, ¼ of your plate with protein foods and the last ¼ of your plate with carbohydrate foods. There is not a “one size fits all” eating pattern for people with diabetes. Many different eating patterns are reasonable for managing diabetes. Work with a registered dietitian or certified diabetes educator on a meal plan that is right for you. Looking for meal plans? Sign up for our Recipes for Healthy Living resource. It's free! Did you find this content to be helpful? Want to talk and share tips with others who are figuring out meal plans themselves? 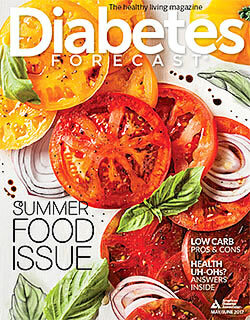 Visit the American Diabetes Association Community today!